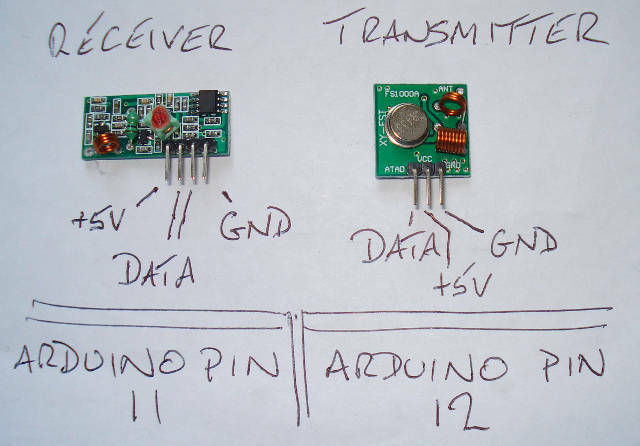 Above is a cheap and cheerful wireless transmitter and receiver. (Approx £ 4.50 on EBay UK). I investigated libraries to use these, and decided on RadioHead, which is Copyright (C) 2008 Mike McCauley and distributed under the open source GPL - which means you can use it as much as you like at home. The library has several methods of working; the most basic protocol (RH_ASK) and the first example worked well for me. However, do note that the library code can and should be read to determine it's usage . I started using these to communicate with my remote controlled car with a joystick, so expect all code below to be developed with that purpose in mind. For the receiver: connect either of the DATA pins to the Arduino pin 11 - both pins output the same info. For the transmitter: connect the DATA pin to Arduino pin 12. The pins 11 and 12 are defaulted in the library RH_ASK.h; I had no need to investigate this further or to change them. Notes : Always keep both pins 11 and 12 free. If you have the Tx on one arduino, and the Rx on a different arduino, you must still keep pins 11 and 12 free on BOTH arduinos. With a 5V power supply and no antennae, I have a range of about 1 metre. Okay for prototyping and testing.